KEIZER — Msgr. Gerard O’Connor believes that if western Oregon Catholics increase devotion and reverence at Mass, overall zeal might return to the local church. “This could turn things around,” Msgr. O’Connor said March 16 during a liturgical training held at St. Edward Parish here. 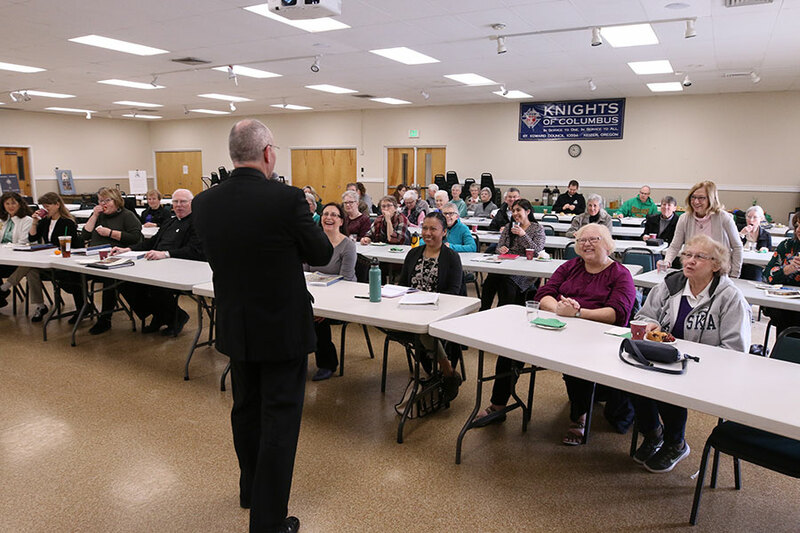 More than 50 people attended the session, which focused on the Archdiocesan Liturgical Handbook. The 385-page reference document offers not just guidelines, but a theology that calls for a liturgy with additional chant, more silence, a clear distinction between priest and laity, and a deep recognition of the mystical events that happen at every celebration of the Eucharist. 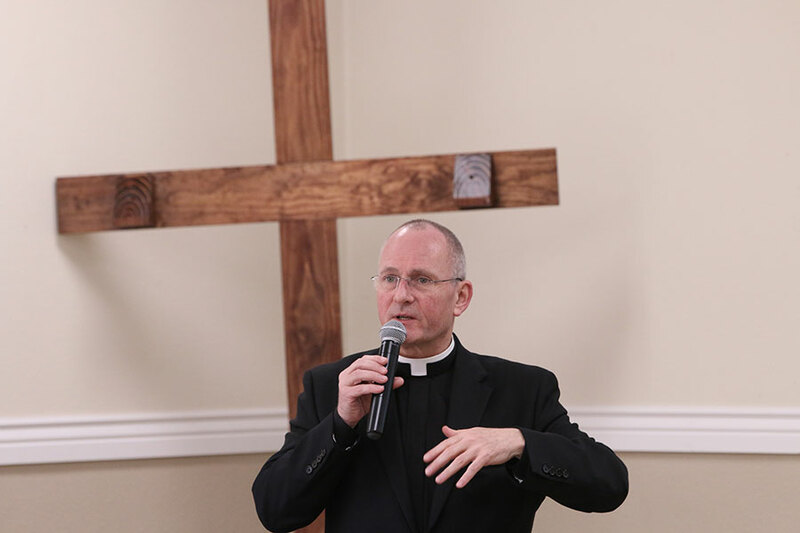 Many who attended the three-hour session are on board with the monsignor’s view that some liturgical changes in the 1970s and 80s went in directions not intended by the framers of the Second Vatican Council, and that understanding of the teachings is still in progress. No one at the training, including the monsignor, called for a return to the 1950s. But many do want what they see as a balance of reverence and relevance, a movement that has emerged in the past few decades. “I appreciate the fact that we can get so many errors straightened out,” said Nancy Larson, a member of St. Paul Parish in Silverton. She cited Masses with clowns and having the whole congregation walk up to circle the altar during the Eucharistic prayer. “Now we are coming back more to the middle, which is good,” said Eric Wunderlich, a member of Queen of Peace Parish in Salem whose son is enrolled at Mount Angel Seminary. The elder Wunderlich remembers his boyhood, when his family fell away from church. That happened after parishes began experimenting with implementations of the teaching of Vatican II, which ran from 1962 to 1965. The council actually sought a return to forms of worship even older than the medieval period, but some Catholics say many dioceses and parishes engineered the re-sourcing in a way that neglected centuries of worthy tradition. Msgr. O’Connor, chief author of the handbook, said there will be no policing or punishment for parishes that fail to follow the guidelines. However, he said, he and the archbishop do hope that everyone considers the handbook in prayer and seriousness. Not everyone at the training is happy about the handbook. One Salem Catholic who prefers not to be named said that more Latin plus measures that further distinguish the roles of laypeople from clergy set up a division that is not good for the church and not in keeping with Jesus’ preference for commoners and sinners over religious leaders. “It leaves us out,” she said. Msgr. O’Connor — half way through a three-year term of being on loan from the Diocese of Fall River, Massachusetts — reported that he has indeed received letters of objection about the handbook as well as about the archbishop’s recent letter on sacred music. The monsignor’s responses are a variation on a theme: There is nothing new in the handbook; the archdiocese is offering what it sees as the mind of the church; liturgy is not about us, and is not our work, but is really the work of Christ within his church. “People say, ‘This is the way we do it at our parish.’ Well, no. We are Roman Catholic,” said the monsignor, who holds a doctorate in sacred liturgy from the Pontifical Athenaeum of St. Anselm, the Benedictine university in Rome. He said the once-popular notion that liturgy is the “work of the people” was misinterpreted to mean that people should be able to do what they want in worship and should get creative and entertaining. In addition to theology and guidelines for worship, the handbook offers information such as who can become a godparent or confirmation sponsor. The document urges churches to remain open for adoration of the Eucharist. Anyone can download a searchable PDF copy for free from archdpdx.org/divine-worship. Amazon offers a Kindle version for $9.99 and paper copes for $25 (black and white) and $50 (color).